It only stands to reason, when you think about it: teenagers who grew up in this age of social media have strong online branding skills. They’ve been refining their personal image and taking note of how others are doing it for a majority of their lives. “We’ve been personally branding ourselves since we first got Facebook,” says Andriy Tkach, 18, and spokesperson for a teen-run web design firm in Regina called Cupcakes and Websites. 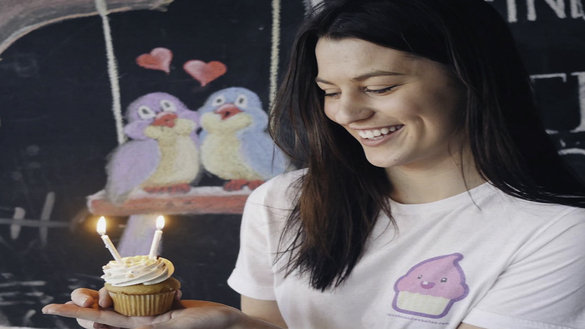 Cupcakes launched in August 2017 and employs four young people in addition to Tkach, all on a part-time basis. Connor Brezinsky, 17; Misha Tsymbal, 18; and Ahmed Keshta, 14, provide services that include coding, design, app development and search engine optimization. Logan Gelowitz, 18, and the newest hire, serves as Cupcakes’ social media guru. “Logan does Instagram and Facebook and all social media, and she does them way better than any of us,” says Tkach. Right now, he adds, Logan is on the road for five days working with a client in Fort McMurray. “We never thought all this could grow so fast.” Cupcakes is looking for other student employees. While they do much of their work from home, Cupcakes employees have workspace at StratLab’s offices in downtown Regina and enjoy easy access to StratLab staff should they require guidance. Tkach says he and his young colleagues are paid well, for students. Pay is much better than the minimum wage he earned at his weekend job in high school, he adds. Outside of exam time, Cupcakes staffers typically work a couple of hours a day and make an effort to show up at the office on a regular basis. They well understand that communicating with co-workers is an essential part of the business, says Tkach. He says the work experience and flexible hours that accommodate the student staff are the greatest benefits for young people working at Cupcakes and Websites. While it may sound as though Cupcakes and Websites is a great part-time job for young people wishing to earn a dollar while pursuing their studies and, in time, other careers, Tkach says their young company is not necessarily just a bridge to other things. Entrepreneurism seems to be seeping into their DNA. “We don’t know where this is going but none of us is here only to make a dollar or to use this experience to venture out to different colleges or other cities.” Tkach allows that one never knows where life’s path will lead.